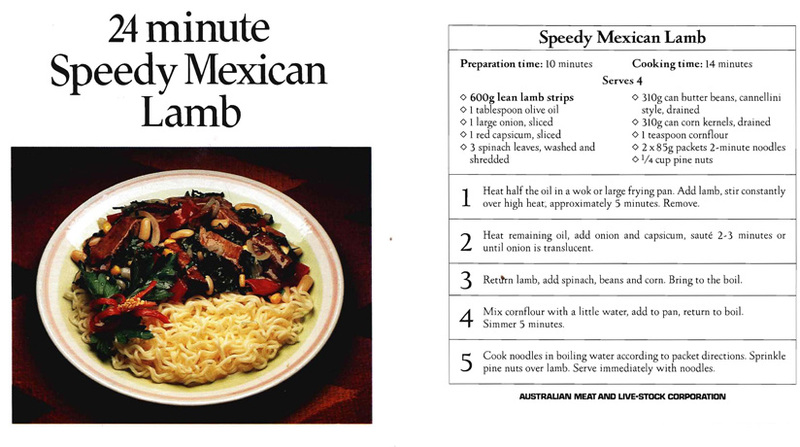 As you can see the full title of this recipe from the Australian Meat and Live-Stock Corporation is ’24 minute Speedy Mexican Lamb’, a bit long I thought so I’ve shortened it. The good thing is that it’s quick to make. I think the recipe card was put out by the Corporation in the late 1980s, whenever it was, Mum and I both seem to have collected quite a few from our butchers’ counters. This entry was posted in All Recipes, Lamb, Main Dishes and tagged 1980s. mexican lamb, 2-minute noodles, cannellini beans, lamb strips by bebsrecipes. Bookmark the permalink.